Contestants, Coaches, and Judges will be admitted for free. Concessions will be open on south west corner of the stadium (home side). 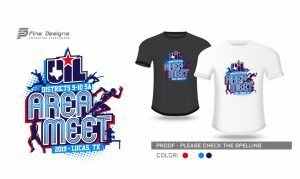 Area Track & Field t-shirts will be for sale on the home side near the concessions stand. Tee shirts are customizable by color, style, and what is printed on the front, back, and sides. The tee shirt design is below.